Last year at this same time I was in Paris, city of love, on my honeymoon. We rented a small studio in the center, so we immediately felt like we are really living there. We did not have much time to see all these beautiful sights, so we started exploring right away! First on the list was the Eiffel Tower. Line was not so long as we expected, so we quickly found ourselves in an elevator that has led us to the top of Paris. For people who are afraid of heights, it might look a little scary, but when you see that view, all fear stops. In front of Notre Dame there bunch of tourists of all races and nationalities. We joined them in watching the true Gothic masterpieces. In the streets around Notre Dame, there are many souvenir shops where you’ll find magnets, key rings, t-shirts, paintings of Paris and everything else that comes to your mind. I love souvenirs so I bought bunch of things. After sightseeing, we walked a bit along the river, waving at the tourist boats, and then we moved to the other side of river to visit something a little more modern – Georges Pompidou Centre. My husband was thrilled with the variety of pipes that have surrounded the building, and I liked the atmosphere around it. And then the Louvre, one of the largest museums in the world. Since we didn’t have much time, we decided to rescheduled our coffee with Mona Lisa for some other time! 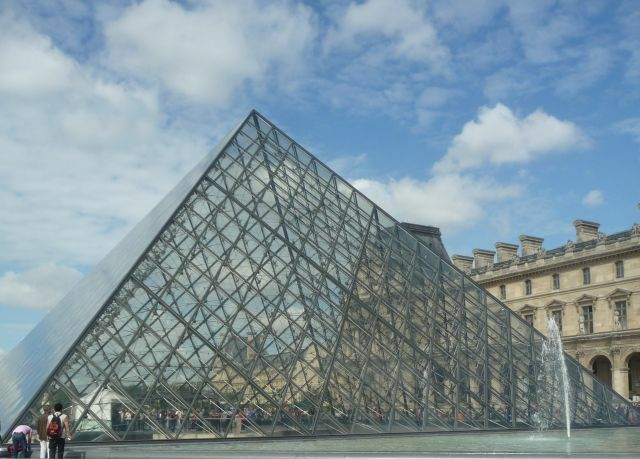 But, Louvre is really spectacular! We also walked down Avenue des Champs-Élysées, where I grazed my eyes on the jewels, perfumes, expensive fashion brands, while my husband rolled his eyes. He was much happier in the Latin quarter, where he did not know what food to try first. Every part of Paris really is engraved in our hearts, but the best and most picturesque part of Paris is Montmartre, home to numerous number of artists. On top of this hill is a beautiful white basilica of Sacré-Coeur on whose steps and lawns tourists rest after a strenuous walk up to Montmartre. This is only a small part of what we saw in Paris, and I definitely hope that we will again have the opportunity to visit it. Paris is beautiful! I love these pictures!! And you look great! I miss Paris so much, I need a trip so bad :). I have such beautiful memories of Paris… Me and my boyfriend were there in 2005 for 15 full days, one of our first (and most beautiful) holidays together! Great city, uh?! 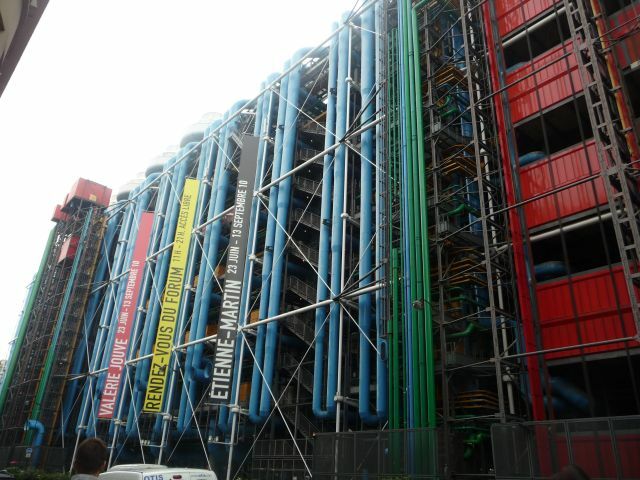 I LOVED Le Centre Pompidou! Very unique design both inside and out. Paris is one of my ALL TIME favorite cities-I can't help but falling in love with just the idea of it let alone actually spending time in the city! 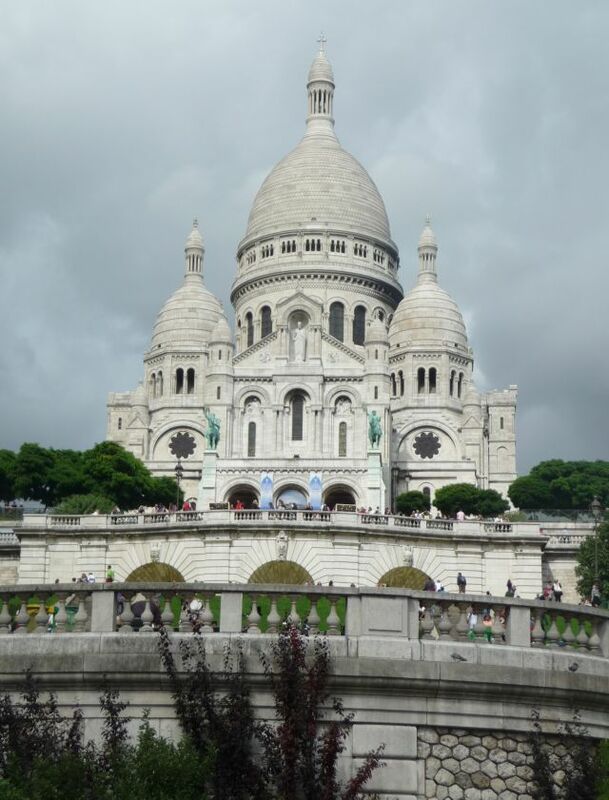 When I was there and we went to Sacre Coeur at night-the lights were softly lit and the nuns were singing french hymns…it was heavenly! Thank you for the trip down memory lane! I feel sorry for anyone who never gets to see Paris. I was a bit ho hum about seeing it before we went, but it was magical. SO jealous, I would LOVE to go to Paris. wow sounds like fun. will follow. I love Paris, beatiful Paris! I've been living in Paris for over a year now 😉 Should I consider myself a lucky one? Wow, a honeymoon in Paris must have been amazing!!! My husband and I just went to the Bahamas and sat on the beach the entire time! You are so lucky!! Awesome. How long were you there for? Paris looks awesome! I've never been. I just got back from my honeymoon in France as well. loves it! I was in Paris in 2006 and it was such a wonderful time! I'd love to go back and this post definitely makes me want to! Glad you had a wonderful honeymoon! I've always wanted to go to Paris! Love the pics! This just got me so excited! I'm going back to Paris in November for Thanksgiving, and can't wait!!! Fantastic post; you brought your memories of Paris very vivid; I think I could imagine your studio…was that where Julia was? Great photos! I love Paris, and was there a few years ago myself. Now that I've just finished a French course I have an excuse to go back to make use of it! Look how cute you are! This makes me miss Paris so much. I was there two year ago! I'm so incredibly jealous! I will definitely keep reading because I want to live vicariously through you! Thanks for the update! Looks like you're having fun! great photos i wish i could go to paris one day! thanks for the comment! Wow! Looks fantastic! What a great opportunity. I hope to visit Paris someday! What a lovely vacation! 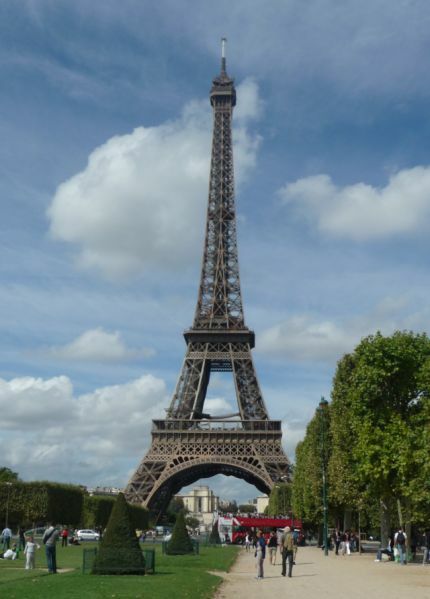 Thank you so much for posting–I've always wanted to visit the City of Lights. Take care! oh i so want to go to Paris again! lovely pictures. I am so jealous! We are hoping to go next year, and Ive been thinking about renting an apartment there! Happy Wednesday! My favorite moment from Paris (2009) is siting below Eiffel Tower, sipping wine and waiting for Tower's light to be switched on – unforgetable! My girlfriend has always wanted to travel to Europe. Hope I can take her there one day. Hi, I love Paris!!! It is only three hours train drive away from either Frankfurt or London and it is my favourite weekend away destination – I never get tired of it. I did the sightseeing the first time so now I only indulge in lazy strolls through secluded streets stopping only to savour the amazing French food. Being half way through Frankfurt and London I also get to meet my girlfriends there for long weekends – sipping coffee and making shopping ( although it is quite expensive). What an amazing vacation that must have been. Beautiful pics!!! How romantic that you spent your honeymoon in Paris! I hope to visit there some day. Aloha Marina, that would be the perfect chance to try a Laduree macaron! Maybe you will try it someday while you are in France again. I wish I could go 🙂 Lucky you!